Welcome to Penuktukan. This fishing village is just opposite Angels Canyon, which is one of the most beautiful house reefs on the north coast of Bali. You will find our idyllic resort on the outskirts of this village. 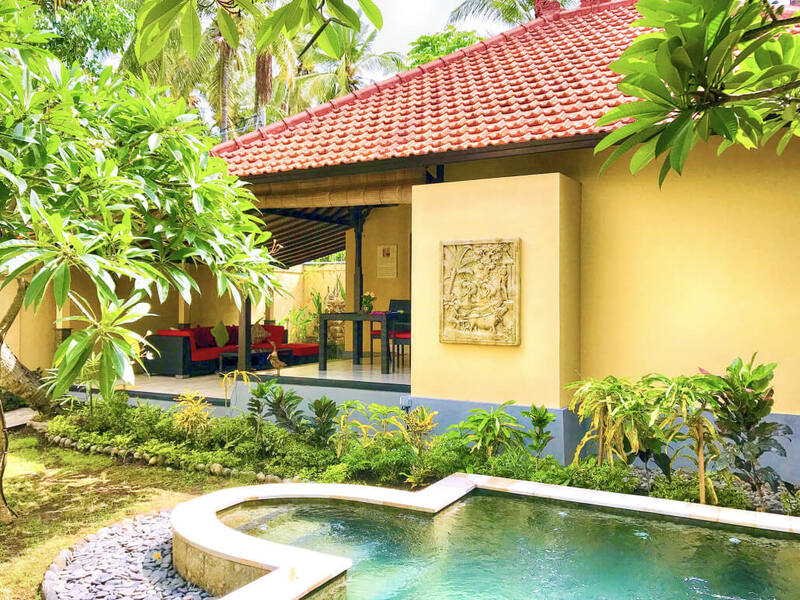 Protected by palm trees and luxuriant vegetation and overlooking the beach, this haven of peace and happiness generates an authentic and welcoming environment based on the little things that count. 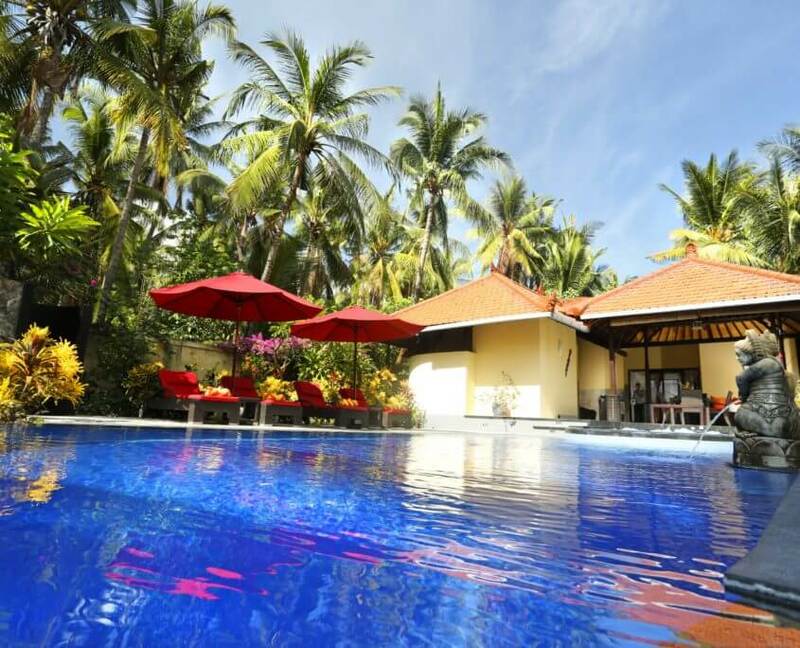 Enjoy the casual and friendly atmosphere of a place that gratifies your personal wishes – dive into your paradise. By clicking on the inbuilt play button to the left, a short acoustically accompanied video clip will start which shall help you to receive an impression of Bali’s little paradies. Many thanks to our friend Christian Pudlo for the diverting film pastiche of the “Teluk Karang” and hope you enjoy watching the clip. Within the last months in the back end of the resort emerged a heavenly, tropically planted area, the new Chedi Garden. The pool villas “Nala” and “Damayanti”, dimensioned for two persons each and very comfortably furnished, build the centre of the Chedi Garden. A joint roof construction links the two villas, which are located in a right angle to each other, with a huge roofed patio area. Including a jumbo jacuzzi, which is integrated into the patio, and an attached 10m x 5m large private pool, the Chedi Garden will form an own, largely enclosed world of experience, an oasis of calm and relaxation. It is ideal for honeymooners, families or two couples which appreciate the exclusivity of a private hideaway. 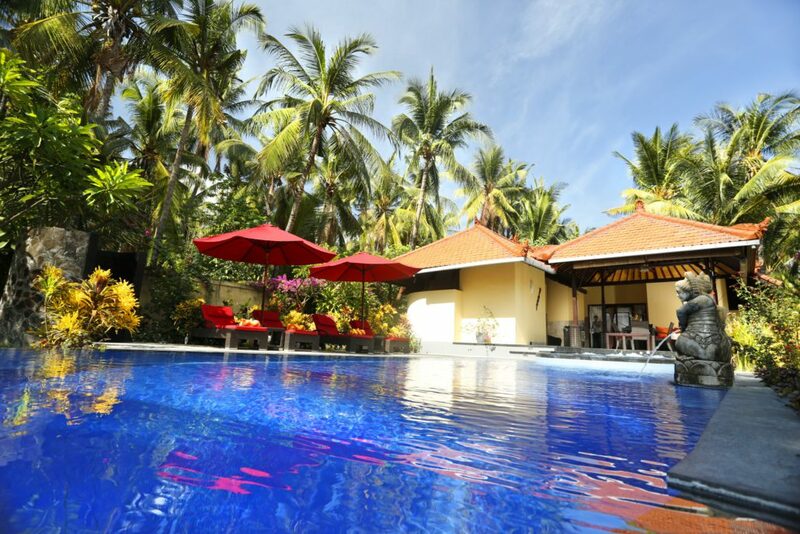 Both pool villas can be booked separatly. In case of a single booking, the second villa will stay unoccupied! Deceleration from the first moment! 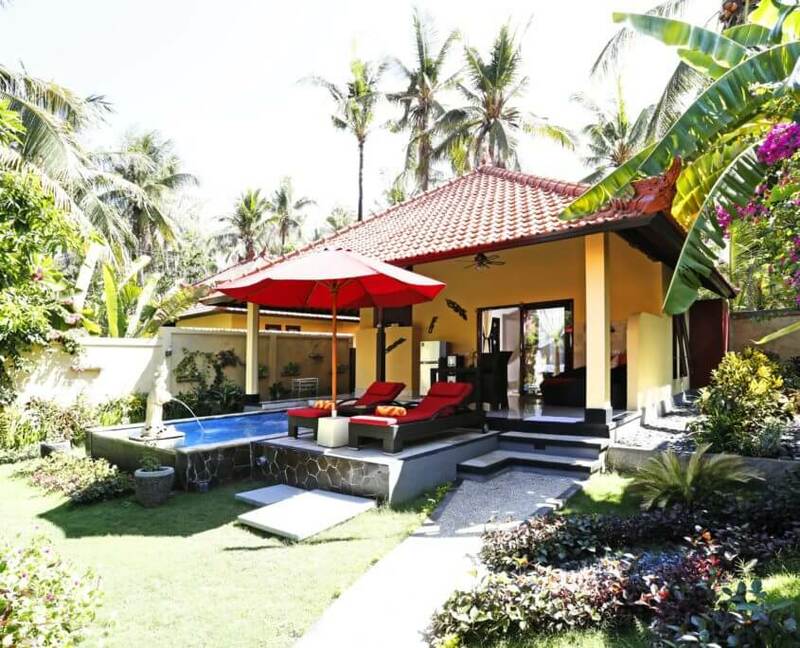 The Villa Yudistira with 2 bedrooms and a bathroom is ideal for 2-3 persons. 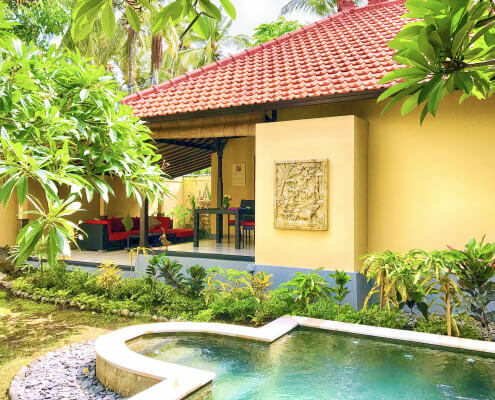 It has everything you need for a relaxing holiday in a private atmosphere: a garden surrounded by lushly planted walls, a large, shady terrace and a refreshing plunge pool. 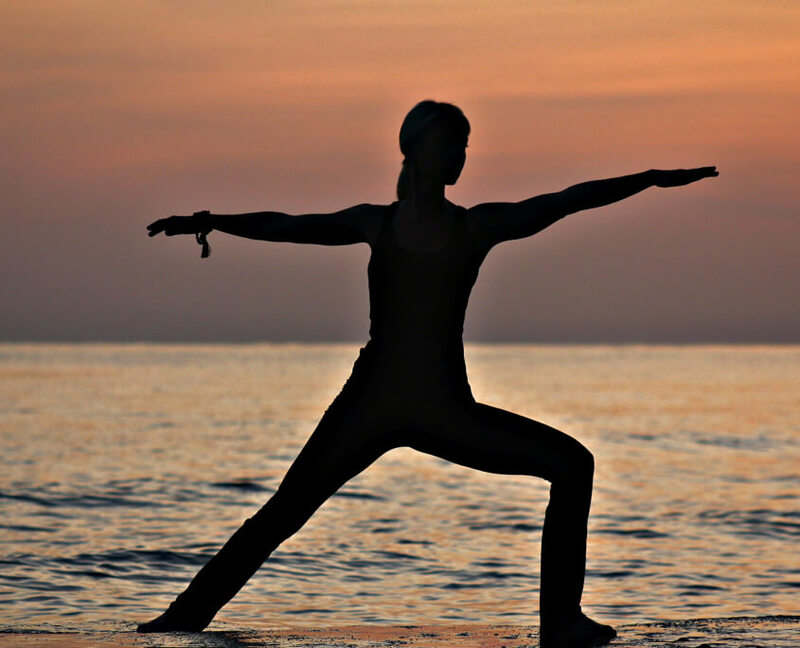 Diving and yoga – why not? In cooperation with a neighboring resort, which specializes in yoga seminars, we are happy to offer individual yoga sessions in small groups if you are interested. The offer ranges from the introductory course with relaxation, breathing and concentration exercises to professional yoga classes for advanced students. A private swimming pool (3x5m )integrated in the terrace, residential comfort at a high level, a bathroom with rainforest shower and special lighting effects composed of noble materials, in short, a little paradise in paradise. Did not find the right thing yet?